Reverse transcribed the class FISH441 RNA to cDNA. Followed protocol provided on the FISH441 Wiki page, NOT the usual Roberts Lab protocol, with some modifications. Changed total reaction volume to 50uL to accommodate volume of RNA, as well as low concentration of dNTPs that were to be used. Samples were heated at 70C for 5mins and placed immediately on ice. Added 31.25uL of the reaction buffer master mix to each well of RNA/Oligo dT. Reaction was run at 42C for 1hr, followed by 70C for 3mins. Samples were stored @ -20C in Rm. 209. This entry was posted in Miscellaneous and tagged FISH441, M-MLV, reverse transcription on 21 November, 2012 by kubu4. Performed reverse transcription using random primers (Promega) diluted 1:100 (5ng/uL) with 175ng of DNased total RNA. Random primers were used because we will be targeting V.tubiashii RNA instead of eukaryotic RNA. 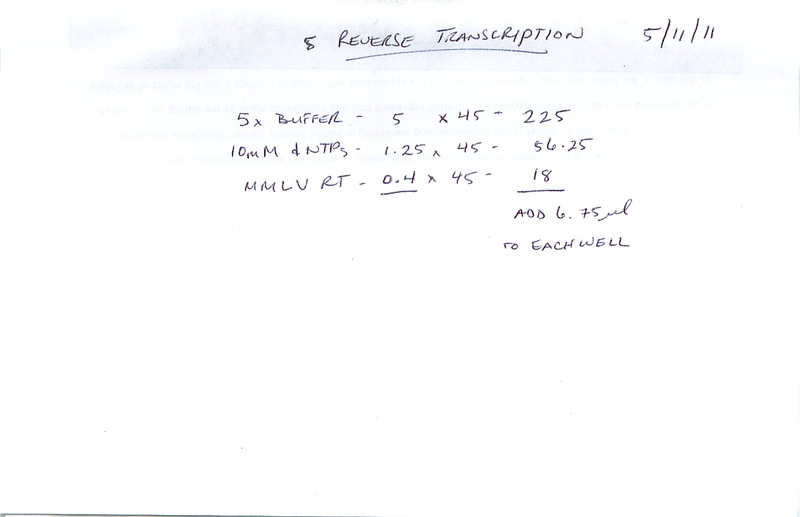 Reverse transcription was performed with M-MLV Reverse Transcriptase (Promega) according to the manufacturer’s protocol. Calcs are here. Created dilutions of all samples to 100ng/uL in a volume of 50uL in preparation for qPCR analysis. Calcs are here. This entry was posted in Miscellaneous and tagged M-MLV, reverse transcription, RNA, Vibrio tubiashii on 30 April, 2012 by kubu4. This entry was posted in Miscellaneous and tagged DNased RNA, M-MLV, Manila clam, reverse transcription, Venerupis philippinarum on 12 March, 2012 by kubu4. Performed reverse transcription on Dnased RNA from 20120125 using 175ng RNA from each sample. Also used random primers (instead of the usual Oligo dT primers) since these samples will also be used to analyze gene expression in Vibrio tubiashii. cDNA calcs are here. This entry was posted in Miscellaneous and tagged DNased RNA, M-MLV, reverse transcription, Vibrio tubiashii on 8 February, 2012 by kubu4. Performed RT on DNased RNA using Promega MMLV RT and Oligo dT according to manufacturer’s protocol, using 1ug of DNased RNA. Due to large number of samples, cDNA was made in PCR plate. Plate layout and calcs are here. cDNA was diluted 4-fold (to 100uL total volume) based on qPCR done by Emma on 20110202. This entry was posted in Miscellaneous and tagged cDNA, Crassostrea gigas, DNased RNA, M-MLV, Pacific oyster, reverse transcription, Vibrio exposure on 11 March, 2011 by kubu4.